How Did Colonial People Make Candles? What candles will you make? Candle making is one of the oldest industrial arts and has created both practical objects and beautiful decorative pieces for centuries. Today, many people choose to make candles as a relaxing hobby and satisfying craft project. With many different types of candles that can be easily made by hand, anyone can experiment with finding their inner candle crafter. Floating: These candles look beautiful floating in a bowl or vase. Gel: This type of translucent or clear candle is elegant and easy to pour. Pillar: Pillar candles can be made in a variety of shapes and styles. Jar: Candles in jars are some of the easiest for novices to make. Tealight: Small candles are quick and simple for all crafters to create. Votive: Larger than tealights, votives are just as easy to make. Taper: Tapers are fun candles to dip with different colors of wax. 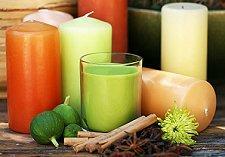 Hurricane: These candles are designed so the outer shell stays solid and are often made from chunks or layers of wax. Figural: These creative designs may be flowers, animals, letters, or abstract shapes that can be molded, dipped, or carved. Scented: Adding a few drops of a favorite scent can make any candle project extra special. Many people make candles for their own enjoyment, but homemade candles also make wonderful gifts for birthdays, bridal showers, and holidays. Basic candles are perfect for emergencies. More elaborate designs can be used as special gifts or for different personal or religious celebrations. Skilled crafters may even start their own candle making business to market their wares or to teach this unique crafting skill to other interested individuals. Always use the proper candle making materials including types of wax, molds, and heating tools, particularly if you are unfamiliar with the candle making recipe or procedure. Read all instructions thoroughly before beginning so you can be prepared for unusual steps or techniques. Follow all necessary safety precautions when heating and melting wax, pouring hot wax, cutting candles or wicks, and other steps in the candle making process. Carefully supervise all children and pets when making candles to avoid accidents and emergencies. Only experiment with new recipes or improvised techniques when you are experienced with each type of candle making. Burn candles away from flammable materials. Never leave a burning candle unsupervised. For more information about making candles as well as different project ideas, visit LoveToKnow Crafts.